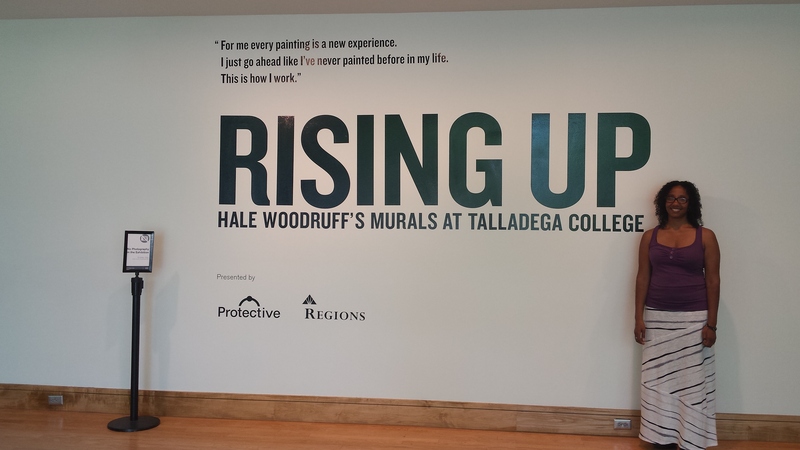 When I flipped over the June 11-18 edition of Weld for Birmingham and saw the ad for Rising Up: Hale Woodruff’s Murals at Talladega College at the Birmingham Museum of Art on the back page, I knew we had to fit the exhibit into our itinerary. The vibrant colors and powerful images of the mural, The Rise of the Amistad, depicted in the ad struck me. 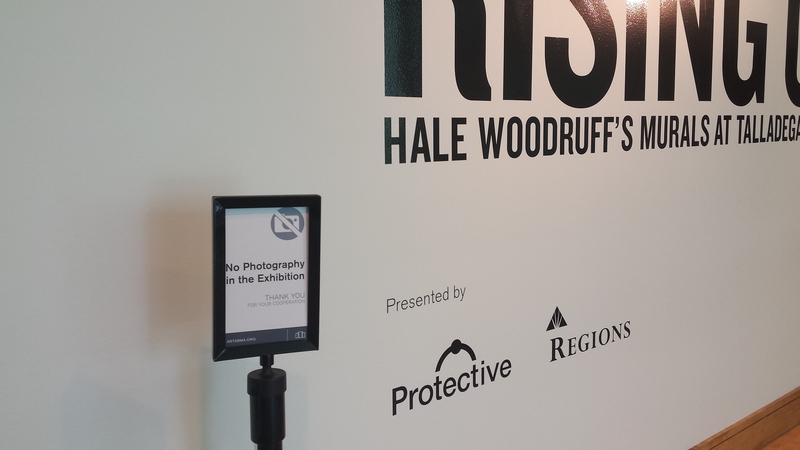 When we arrived at the museum, I was disappointed to learn that photography inside the exhibit is forbidden. 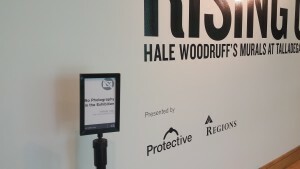 As I visit museums, I’m discovering that photography tends to be allowed in historical exhibits, while understandably, it is likely to be forbidden inside of art exhibits. 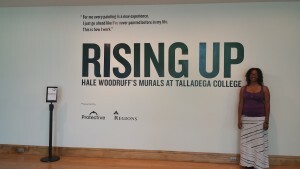 I do not remember hearing of Hale Woodruf or Talladega College before seeing this exhibit. I was fascinated to learn that the abolitionists who helped the Amistad mutineers also established the American Missionary Association, the racially integrated organization that helped found many southern universities for African-Americans, including Talladega College. Woodruff’s set of Amistad murals was completed in 1939 for the opening of the College library. I was surprised to see such enormous, vibrantly colored, violent images of Africans overtaking their white captors from so early in the 20th century. We sometimes get a one-dimensional impression of history that all forms of Black expression were stifled during the Jim Crow era, especially in the South. I am familiar with early 20th Century art from the Harlem Renaissance, but I was not familiar with Southern artwork, especially this type of resistance work of that era. I can’t help but wonder how Woodruff was able to spend hours working on these depictions of strong victorious Africans and then leave the college and tolerate Alabama’s strict segregation and widespread anti-Black terrorism. The beautiful, strong images of the Amistad mutineers during the mutiny and its aftermath took my breath away. Even in the courtroom mural, Cinque’s is, by far, the most powerful image in the painting. Standing confidently, arms folded, he is the only standing figure in the painting whose full body is shown. The second set of murals, The Founding Panels, show, first, a dramatic scene from the Underground Railroad in which Black people are escaping slavery and whites are assisting and taking them in. The panels go on to show the building of Talladega College and the productivity possible among an integrated team of workers. The exhibit includes pieces of Woodruff’s artwork other than the murals. Those pieces show the evolution of his style, his experimentation with cubism and traditional African styles. Woodruf’s murals are touring the nation. They will next be at the Nelson Atkins Museum of Art in Kansas. Trust me when I say that you do not want to miss them! Thus, when they arrive in a city near you, make the time to witness these tremendous works of art. 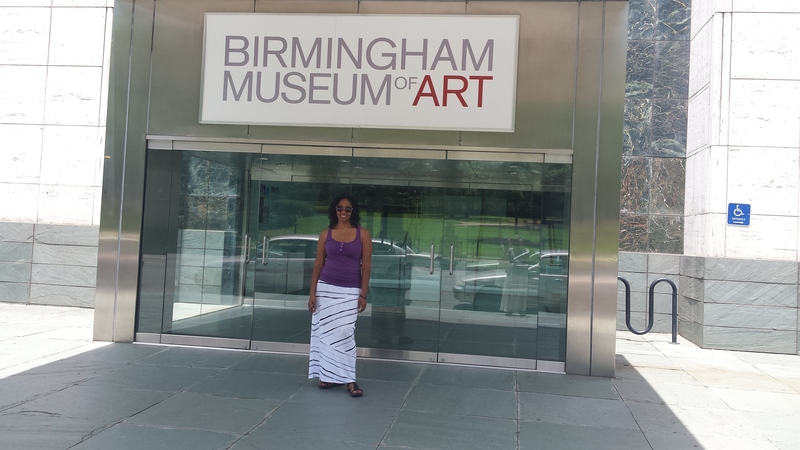 Check back on Monday, August 3rd to read about my visit to the Rosa Parks Museum.